The Open Budget Survey Data Explorer lets users examine current and previous results of the International Budget Partnership’s Open Budget Survey in a myriad of ways including maps, timelines, regional comparisons, and more. IBP and its civil society partners encourage governments to use the OBS findings and recommendations to guide reforms to improve budget transparency, engagement with citizens and civil society, and effective formal oversight. 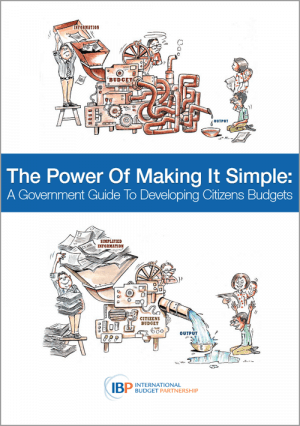 Explore additional resources governments can use to improve budget transparency, accountability, and oversight. The Open Budget Survey 2017 shows a modest decline in in average global transparency scores, halting progress toward greater transparency that surveys over the past decade have identified. This means that many governments are making less information available about how they raise and spend public funds than they did in 2015. This finding is particularly discouraging given that roughly three-quarters of countries assessed publish insufficient budget information. In addition to these transparency challenges, the Open Budget Survey 2017 assessment of budget oversight finds that most countries have limited or weak legislative oversight practices, though most have the basic conditions needed for auditors to perform their roles. The 2017 survey also reveals that most governments fail to provide meaningful opportunities for the public to participate in the budget process. Download resources below to learn more. The Open Budget Survey 2017 full report is the most comprehensive resource available on the findings and recommendations of this global assessment of budget transparency, participation, and oversight. It includes detailed information on the key findings, country rankings, research methodology, and more. 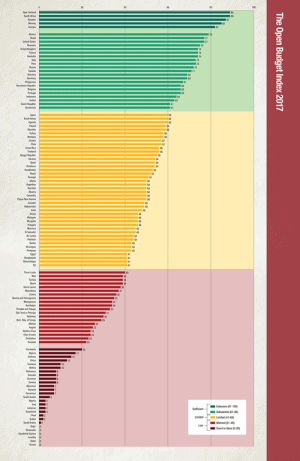 The Open Budget Index is the world’s only independent and comparative measure of budget transparency. 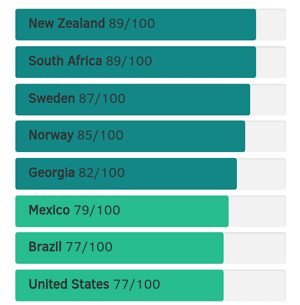 The Open Budget Index scores each country from 0 to 100, based on the average responses to the 109 indicators the Open Budget Survey uses to measure budget transparency. These indicators are used to assess whether the central government makes eight key budget documents available to the public in a timely manner and whether the information contained in these documents is comprehensive and useful. 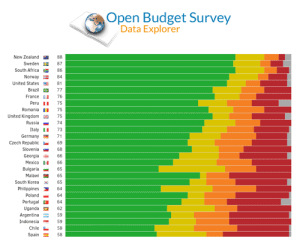 See how the 115 countries surveyed compare on the Open Budget Index 2017. This short summary focuses on key findings from the Open Budget Survey 2017. 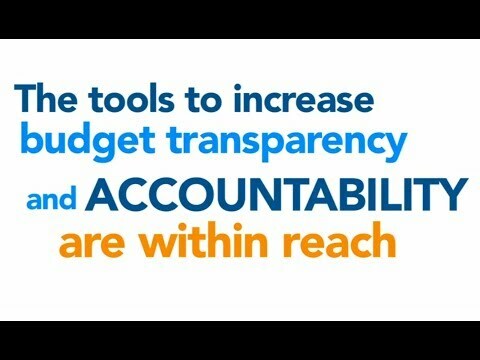 Adapted from the complete report of the Open Budget Survey 2017, the executive summary brings together the survey’s global findings with recommendations for governments, and civil society, and donors to improve budget transparency, participation, and oversight in budget processes around the world. Individual Open Budget Survey country summaries are available for download on each country’s results page. Country summaries include details on the OBS 2017 findings for each country surveyed on transparency, participation, and budget oversight. The summary also includes regional comparisons, changes in transparency over time, and recommendations for improving transparency, participation, and oversight. Each country page also provides links to country’s results from previous rounds of the OBS. The Open Budget Survey Methodology includes more information on how the survey assesses the three components of a budget accountability system: public availability of budget information; opportunities for the public to participate in the budget process; and the role and effectiveness of formal oversight institutions. Learn more about the Open Budget Survey 2017 research methodology here. The results for each country in the Open Budget Survey 2017 are based on a questionnaire, comprising 145 scored questions. The Open Budget Survey 2017 Questionnaire and Guidelines includes the survey questions and the guidelines for answering survey questions. 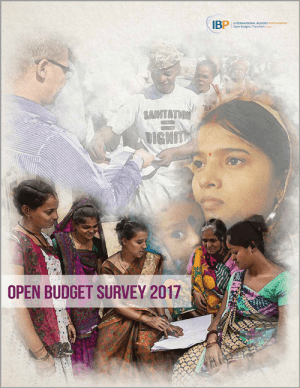 Download datasets from the Open Budget Survey 2017.